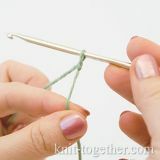 Knit Together | Crochet Cucumber Motif. Photo, description and crochet chart. 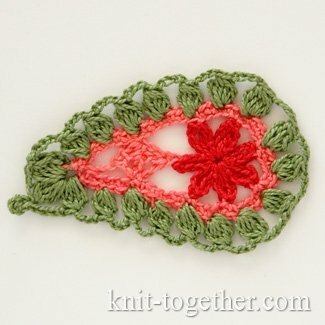 We can divide the work on the motif "cucumber" into three stages: first make the flower (red), then central part (pink), then crochet on the contour with the bobble stitch (green). The place, where begins the next stage, is shown numeral in the crochet chart. Central part (pink): join pink yarn to any petal, 6 chains, 1 double crochet in first of 6 chains, 1 chain, 1 double crochet in same chain as first double crochet, turn the work, make 2 chains, then make 1 incomplete double crochet in stitch of previous row and 1 double crochet in last chain of previous row, join chains and stitches in common top, turn the work, 8 chains, 1 slip stitch in 3rd of this chains (we made the top of the cucumber). Then 5 chains, 1 slip stitch in double crochet, 5 chains, slip stitch in treble crochet of petal. 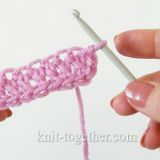 Continue join petals with chains: * 4 chains, slip stitch in treble crochet of petal * - repeat 5 times. Then 6 chains, slip stitch in 5th of 6 chains, 6 chains, join the top of cucumber with slip stitch. 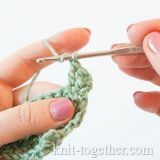 Then crochet on the contour with single crochet, except loop, which was formed in the top of 5 chains. 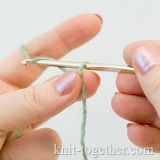 Selvage (green): in chain of 5 chains (which forms the top of cucumber), make 3 bobble stitches consist of 5 double crochet (in the first bobble stitch, instead the first double crochet make 3 turning chains). Between bobble stitches make 4 chains. 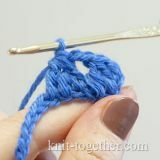 In top of central bobble make chain of 5 chain stitches, which join with slip stitch to top of bobble. 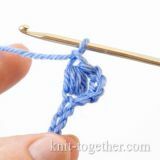 Then make bobble stitches in each 3rd single crochet of previous row, between bobble stitches make 4 chains. Join with slip stitch. Bobble stitch. Five double crochet with one base and common top (5dc bobble). Make in space. Bobble stitch. 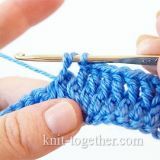 Five double crochet with one base and common top (5dc bobble). Make in loop.